All eyes are on Wimbledon from today and brands have been piggybacking on coverage of the iconic sporting event. Promotion has been car heavy this year. Jaguar has signed up as the official car partner of The Championships and will provide 170 vehicles throughout the course of the tournament. It's also kicked off day one of the event by promoting a #FeelWimbledon campaign. Numerous other household names from Aston Martin through to Vogue have attempted to capitalise on the social media buzz. Some have secured the services of top tennis players to promote products and the majority of endoresements are being carried out by female pros. World number one Serena Williams was unveiled as the chief sporting officer for Aston Martin. 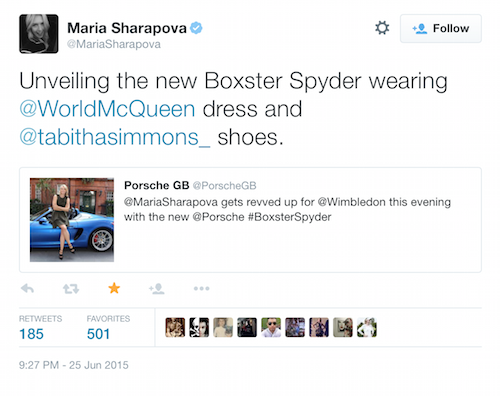 Not to be outdone, Maria Sharapova teamed up with Porsche and showed her social media nous by shoe-horning three plugs into a single tweet. Caroline Wozniacki launched a competition to promote Lavazza coffee. And on the health promotion side Ana Ivanovic is the face of sunscream. On the men’s side, Roger Federer appears to have been the busiest, fulfilling media duties with his sponsor Nike. The Swiss supremo also took a tour around Wimbledon with the Periscope app; ironically, considering tournament officials have told spectators not to use it during play due to concerns about breaching broadcasting rights. Meanwhile, brands that have decided to go it alone include Heineken, Robinsons, Selfridges, Vogue and, of course, Paddy Power.